Why was it decided to make one Let’s Play out of all three? For multiple reasons. One, doing a single Let’s Play per game would have seemed really strange since the first game took 4 episodes to finish. “A Let’s Play with only 4 episodes?” I asked myself. “Let’s just put all three games together”. The other reason was because all three games are connected. Where one ends, the next one begins. It’s one big story. And I remember when I first got the first game, finished it, and saw the promo for the upcoming game, I was like “Wow check this s**t out! Can’t wait to play the next one!! !” And that’s what I did. And the cliffhanger at the end of the second game was even more epic, it felt like the real adventure was just about to begin, that you just played the “introduction” if you know what I mean. Exploring the messy manor of the first game. 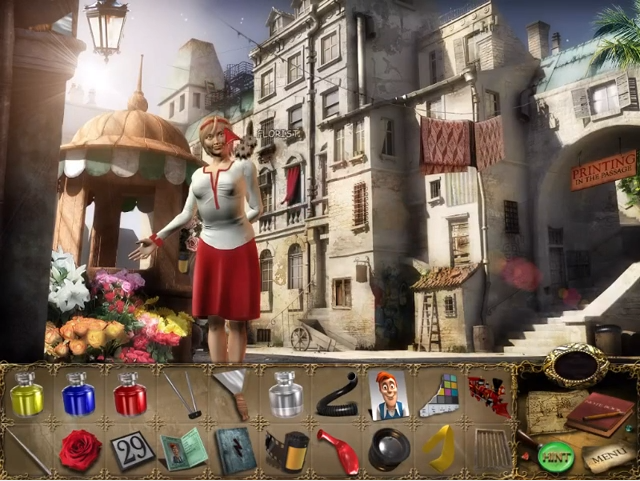 The first thing you should know about this game is its genre: this game is a finding-hidden-object-puzzle game. Basically you explore really messed up 2D areas in order to find objects. Some of those objects need to be put in their rightful place (labelled under Misplaced Items), some others you can use them to perform actions such as a key to open a door, so you can access another area (Puzzle Items). Having played lots of these kind of games in the past, I was indeed surprised by the radical change in gameplay that this game introduced. 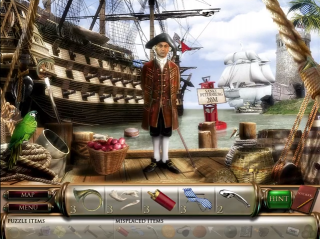 Usually in these games you have a list of objects to find. You either get the name of the object or a picture of it. In this game, you need to find 4 objects in each room you explore, but here comes the catch: each object is split into more parts. A number near the object tells you in how many parts was the object divided, but you don’t know the shape of the splits. This opens up a new way of thinking. Now finding object isn’t easy as it was before: you need to figure out yourself, which things in the screen could be parts of an object. At the time, it was a very interesting concept. The objectives in the levels are quite simple to understand: by finding and using all the Misplaced Items in an area, you get parts of a secret code you’ll need later in the game. Pieces for the Misplaced Items are usually out in the open, not requiring any special actions to find them. And so you go, One area of the manor after the other; climbing toward the top which holds the last area: The Attic. Traversing the areas is simple enough: You can open up a map any time to select an area of the manor, or a room of the area you are in and you’ll immediately go there. But you might be thinking: what stops a player to spam the left mouse button and click everywhere to find the items? The answer is simple: Ghosts. The old manor is filled with ghosts. Some are friendly and will help you if you give them certain objects (and Mortimer has an hint for those in the notebook his uncle left him, but seriously nobody never reads the notebook), but bad ghosts appear when you click too much without finding anything. The game explains why they come: clicking seems to make noise, and ghost don’t like that so they appear to make your life harder. When ghosts appear (there can be more than one if you keep spamming clicks) they roam around the screen trying to confuse you. Sometimes they chase your mouse arrow making it even more difficult to focus. And don’t think moving out of a room will fix this; they will still be there when you come back! To make them go away you just need to wait some time. Every time I’m stuck and I can’t find anything there can be two options: either I don’t see the object or all the objects to find are “behind” things I’m missing the Puzzle Item to interact with. When that happens, I place the mouse cursor over the “Hint” button, close my eyes, click, and listen closely. If there is at least one more object out in the open, I will hear a jingle. This way I know there at least one more thing to find, and then I look for it. If there aren’t object, the game makes a window pop-up saying that all the objects are “hidden” and I need to perform an action to find them. When that happens, hints aren’t used, and the sound is different so I know i can open my eyes with no worries and change area. Even though you can’t see me closing my eyes in the Let’s Play, trust me that I did. Trying to fix the time paradox in the pirate “age”. Hints are unlimited. After using an hint, you need to wait around 10 seconds to use another. You can’t travel to the next “world” without finishing the one you are in. Apart form that, Time Paradox is way harder. The pieces are very very very well hidden. Even the first world is hell compared to the previous game. This, however, is balanced by infinite Hints. The gameplay is the same of the previous title. The areas however are more various and with a lot of weird things in the background to enjoy and look for. And the notebook is finally useful! During your travels you will find codes and cyphers you need in order to solve puzzles. Mortimer will write them down on the Notebook so you don’t have to. Finding one of the gems in the floating town. This is where the gameplay got changed a lot. And to be honest, I didn’t like it that much. The hint system was remade again: hints are still infinite, but this time they take way more to charge up. They probably heard people were abusing the hint system in Time Paradox too much. They also toned down the difficulty a little, making The Lost King harder than The Spooky Manor, but easier than Time Paradox. But what I was really disappointed of, was the removal of the “Broken Pieces” mechanic. The items where completely remade: now you get a list with all the items in the world (not all the items in the screen) and you don’t know which items can be found in the current screen. However all items aren’t divided in pieces anymore, they are just one single block. Items have undergone another change: there is close to no difference between misplaced items and and puzzle items. Yet some of them help you find the exit, others make spawn Pieces of a Jewel you need to complete before you can leave the area. This latter type of items are the old “Misplaced Items”. Overall though it isn’t that bad. The thing that you don’t know which items can be found in the screen you are in and if the thing that you don’t know whether an item is a “Puzzle Item” or a “Misplaces Item” are really great. Too bad the “Item scattered in pieces” mechanic was removed. That mechanic was what made a Mortimer Beckett game a Mortimer Beckett game. No other games had that. The Notebook is still useful. Mortimer still writes down codes and stuff for you. Except on the last two worlds. But was probably meant to be, since the two last levels are supposed to be a little harder than the rest of the game. And The Lost King introduced 3D animation cutscenes between the worlds, as well as a really neat intro and ending sequence, where we can hear Mortimer’s voice for the very first time. …these games are really fun to play. They are really addictive (at least they were for me) and the story is awesome. 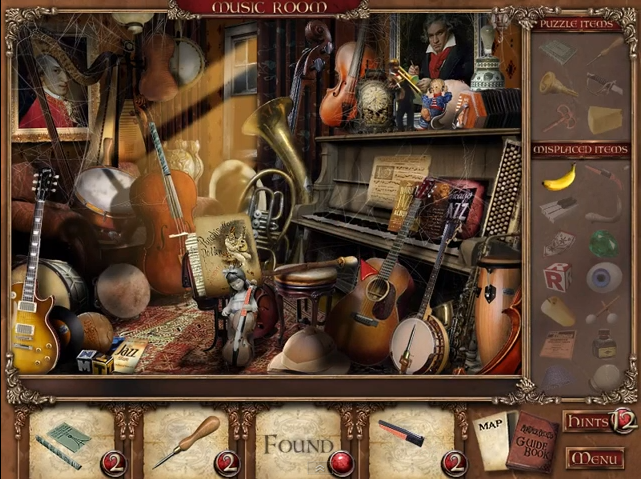 There’s also a fourth game in the series: “Mortimer Beckett and the Crimson Thief”, however it is completely disconnected from the previous titles. Try them if you get the chance.